Crisis averted, or more of the same in Iraq? Glenn Reynolds links Paul Mirengoff at Powerline, who infers that a crisis has been averted in Iraq. I wrote here about the disturbing prospect that the disqualification of hundreds of Sunni candidates in the unpcoming Iraqi elections would degrade those elections and perhaps prompt a surge of sectarian violence. But now, as Max Boot reports based on statements by General Petraeus, it appears that, not for the first time, Iraqi politicians have averted the crisis through a compromise. According to Petraeus, the disqualfication list is no longer weighted against the Sunnis. (There are no doubt many Iraqi figures who richly deserve to be disqualified). Feeling the need to provide an explanation, Prime Minister Nouri Al-Maliki asserted that the decision to ban 500 candidates from general elections is not targeting Sunni Arabs. He said that Sunni Arabs are more than necessary as partners in the political process and that their participation in the March elections is even more important than it was in 2005. Maliki told al-Iraqia TV on Tuesday night that although the list of banned candidates includes many Sunni names, it also includes Shiites, perhaps in greater numbers, according to Maliki. He also pointed out that 70% of the Ba’ath Party members were Shiite. Maliki might be right in saying that more Shiites were banned than Sunnis. However, it is obvious now that, unlike with Sunni candidates, none of the banned Shiite candidates is a prominent political figure. In fact, the media so far has not mentioned the names of any of those disqualified Shiite candidates. I suspect that even of the names are made public no one would recognize them nor would I expect their disqualification affect their blocs in any significant manner. The other important and suspicious point about the ban is that the banned politicians have been part of the political process for several years. This and the timing raise suspicion about the intentions of the Maliki government and the “justice and accountability commission.” While major existing partners in the political process are banned over alleged ties to the Ba’ath Party, the government is at the same time making deals with hostage killers like the group known as Asaib Ahl Al-Haq and is trying to persuade them to join the political process. In light of these facts and suspicions, the ban is perceived by some in Iraq as a systematic targeting of the Sunni political class. Others think the target is nationalist non-sectarian blocs. I agree more with the latter in that the targets are actually blocs that identify themselves as nationalist/anti-sectarian. This is yet another example of the limits of the power of nation-building and alignment with corrupt politicians who have their own power as their first priority. My opposition to Maliki is well known, and although Iraq is not falling apart, it is still suffering from the same sectarian struggles with which it began. Support of sectarian leaders in positions of national power is a path fraught with many problems. This is a lesson that should not be learned again the hard way in Afghanistan in our haste to build a nation-state suitable for our departure. We previously noted that Obama campaign rhetoric on nuclear weapons relied on ending the global threat via negotiations rather than refurbishment and development. In a reversal of that rhetoric, the administration is targeting nuclear refurbishment with new dollars. President Obama is planning to increase spending on America’s nuclear weapons stockpile just days after pledging to try to rid the world of them. In his budget to be announced on Monday, Mr Obama has allocated £4.3billion to maintain the U.S. arsenal – £370million more than George Bush spent on nuclear weapons in his final year. The Obama administration also plans to spend a further £3.1billion over the next five years on nuclear security. The announcement comes despite the American President declaring nuclear weapons were the ‘greatest danger’ to U.S. people during in his State of the Union address on Wednesday. And it flies in the face of Obama’s Nobel Peace Prize, awarded to him in October for ‘his extraordinary efforts to strengthen international diplomacy and cooperation between peoples’. The Nobel committee was attacked at the time for bestowing the accolade on a new president whose initiatives are yet to bear fruit – which included reducing the world stock of nuclear arms. The budget is higher than that allocated by George Bush – who was seen by many as a warmongering president in the wake of the Iraq invasion in 2003 – during his premiership. This represents an important reversal of position regarding the nuclear weapons stockpile. His supporters (who don’t realize – or admit – the half century of deterrence and peace that nuclear weapons have afforded) must surely feel betrayed, but before heaping scorn on him from the left or accolades from the right, it’s best to recall the state of nuclear weapons in the U.S.
… the current path for sustaining the warhead stockpile—successive refurbishments of existing Cold War warheads designed with small margins of error—may be unsustainable in the future. Specifically, the directors of the nation’s nuclear weapons laboratories have expressed concern about the ability to ensure confidence in the reliability of the legacy stockpile over the long term, without nuclear testing. Successive efforts at extending the service life of the current inventory of warheads will drive the warhead configurations further away from the original design baseline that was validated using underground nuclear test data. Repeated refurbishments will accrue technical changes that, over time, might inadvertently undermine reliability and performance. The skills, materials, processes, and technologies needed to refurbish and maintain these older warhead designs are also increasingly difficult to sustain or acquire. Some of the materials employed in these older warheads are extremely hazardous. Moreover, it is difficult to incorporate modern safety and security features into Cold War era weapon designs. As a consequence, the stockpile stewardship program is expanding its range of component and material testing and analysis, and is likely to identify more areas of concern. However, without nuclear testing, at some time in the future the United States may be unable to confirm the effect of the accumulation of changes to tested warhead configurations. As the United States continues to observe a moratorium on underground nuclear testing, certification of the safety, surety, and reliability of the existing stockpile of weapons (with their narrow performance margins) will become increasingly difficult. In the near-term, the United States has no choice but to continue to extend the life of these legacy warheads. However, the Departments of Defense and Energy are pursuing an alternative to this strategy of indefinite life extension; namely, the gradual replacement of existing warheads with warheads of comparable capability that are less sensitive to manufacturing tolerances or to aging of materials. The generic concept is often referred to as the Reliable Replacement Warhead (RRW). The RRW concept promises other attractive benefits such as improved safety and security, production processes that are less complex, elimination of many hazardous materials in existing warheads, and production of less hazardous waste. The directors of the nuclear weapons laboratories believe that modern scientific tools developed for the stockpile stewardship program, including advanced computer modeling and experimental facilities, will enable design and certification of the RRW without nuclear testing. In addition to the technological problems associated with maintenance of older nuclear weapons, the Air Force and Navy have both treated nuclear weapons billets as second class occupations, and have allowed the doctrinal understanding (and availability of the fraction of nuclear weapons that are deployable) to atrophy over the last couple of decades. Obama has spent approximately what Bush did on nuclear weapons refurbishment. In order to ensure a viable nuclear deterrent into the 21st century, much more needs to be done. The U.S. must restart the manufacture and design of a new generation of nuclear weapons. Without this, the RRW program cannot go forward. That will be the test of Obama’s vision and fortitude. This allocation of money is just kicking the can down the road. The left will want to heap scorn upon him, the right will want to praise him for his wise decision. He deserves neither. We have discussed before the notion of the Pakistani pathological preoccupation with India, coupled at least in part with its negligence to see the existential threat to its own state by the Taliban. But every once in a while a report comes along that almost needs no other data, commentary or elucidation in order to demonstrate the point. The Sri Lanka Guardian has such a report. Waziristan is a rugged mountainous area in the remote part of Pakistan. Its inhabitants, tribal people, have been devout Muslims. Over the years they learnt to blend their centuries old tribal traditions with Islamic teachings and thus their life was shaped both by Islam and tribal traditions. As fiercely independent people they maintained their own legal system based on tribal traditions for centuries and the Pakistani laws do not apply there. However their loyalty to Pakistan remain unquestioned .Under such circumstances the question is how come these peace loving people suddenly became radicals and militants to fight their own country’s armed forces killing their own Muslim brothers and sisters. The answer lies in the shocking discovery by the Pakistani armed forces of sophisticated weapons, besides large amount of foreign currencies, from United States, NATO, Israel and India following recent military operations to flush out what the West describe as Pakistani Talebans. However the most startling discovery was the presence of uncircumcised, non Muslim, Talebans among those killed raising eye brows though everyone knows who they are and what they were doing in South Waziristan. An Islamabad datelined report by Akhtar Jamal on Wednesday, 21 October 2009 disclosed that hundreds of militants from Tehreek-i-Taliban Pakistan (TTP) and other associated groups are equipped with most sophisticated American, Indian and German weapons. The weapons in their possession included U.S. made M249 automatic machine guns, and Glock pistols, Indian hand guns, FN Browning GP35 9mmx19mm, Indian automatic machine pistols GLOCK 17 9mmx19mm, Indian machine guns Heckler & Koch MP5A3 9mmx19mm, Indian made Sterling L2A1 sub machine guns, Israeli licensed Indian made UZI 9mmx19mm sub machine guns and German Walther-P1 pistols. Pakistanis in general believe that the “Americans are not interested in Pakistan or its people despite their so called generous aid packages. The American strategy in Pakistan is to put Pakistani government against Pakistanis, provoke civil war and plunge the country into chaos to neutralize its nuclear arsenal that has been US neoconservatives’ urgent priority”. Recently, in the officer’s mess in Bajaur, the northern tribal region where the Pakistani Army is tied down fighting the militants, one officer told a visiting journalist that” Osama bin Laden does not exist”. It was something extremely exaggerated by Anglo American war mongers to justify their conspiracies to destabilize Muslim countries and loot their wealth. This is the reason why Pakistanis suspect that the wave of disappearances, torture and death squad assassinations in Pakistan are also “made in the US”. Meanwhile American mercenaries were accused of bombing and killing innocent Pakistanis in their drive to put the Pakistani armed forces and the people of South Waziristan against each other in their design to do what they did in Iraq and Afghanistan-aggravate the conflict. It is worthy to note that ,according to a former employee, Erik Prince, the founder and the boss of Blackwater, world’s most powerful mercenary army, accused in court papers of seeking to wipe out Muslims, views himself as a Christian crusader tasked with eliminating Muslims and the Islamic faith from the planet. These Blackwater mercenaries are in Pakistan and many suspect that they were behind most of the deadly attacks blamed on the Pakistani Taleban who promptly denied responsibility. Thus the name of the game is same-destabilize Pakistan in the way Anglo American warmongers destabilized and virtually turned Iraq and Afghanistan into wastelands under the guise of fighting terrorism. It is common knowledge that India wanted to destabilize and partition Pakistan from the day it came into being in 1947.India played a crucial role in breaking up Pakistan and creating Bangladesh in its eastern wing exploiting the blunders of the Pakistani’s ruling elite. Three decades later today India, hand in glove with American installed Hamid Karzai’s puppet regime, has 14 consulates in Afghanistan from which RAW operates The US has turned a blind eye. Pakistan has stockpiles of evidence against Indian consulates in Afghanistan used to fund terrorism in Pakistan through Baitullah Mehsud’s TTP as well as Brahamdagh Bugti and his Baluch Liberation Army-BLA. According to Pakistani daily DAWN, a dossier containing proof of India’s involvement in “subversive activities” in Pakistan was handed over by Prime Minister Yousuf Raza Gilani to his Indian counterpart Manmohan Singh during their meeting at Sharm el-Sheikh in July 2009.The dossier, broadly covering the Indian connection in terror financing in Pakistan, is also said to list the safe houses run by RAW in Afghanistan where terrorists are trained and launched for missions in Pakistan. The dossier also mentions an India-funded training camp in Kandahar where Baluch insurgents were being trained and provided arms and ammunition for sabotage activities in the Pakistani province. “Afghan officials have also confirmed that India is using Afghanistan to stir trouble and destabilize Pakistan and Afghan security agencies are unable to stop Indian intervention due to absence of centralized government mechanism”, said Afghan Government’s Advisor, Ehsanullah Aryanzai on sidelines of Pak-Afgan Parliamentary Jirga at a local hotel on April 2, 2009. The RAW is operating out of U.S. bases, Erik Prince is a Christian crusader on a mission to kill Muslims (rather than a clever businessman), the U.S. is funding the Mehsuds (while we also killed Baitullah by a drone strike), the U.S. (who already has quite enough nuclear weapons) is after Pakistan’s nuclear arsenal, UBL doesn’t exist but is a fabricated figment of our imaginations as a surrogate for a war that is really designed to destroy Pakistan – and so on – and on – and on. One wonders when the author is going to claim that he was abducted by Martians and taken for interrogation by green men with big heads. This is so bad that it should be embarrassing, and I actually wonder why the Sri Lanka Guardian published it, except to demonstrate the extreme pathologies that reside just next door in Pakistan. Matthew Potter has penned a very important article at BNET concerning the F-35. I will cite it at length. Veteran newspaper reporter George C. Wilson asked in a recent column that appeared in CongressDaily why rush the F-35 into production? In that gentleman’s eyes the program is experiencing delays in testing and development as well as overall cost to product and operate. In Wilson’s view it might make sense to save the whole $298 billion planned to procure the F-35 since there may not be the necessary threat to justify its purchase. Wilson compares the F-35 to a similar program from the 1960’s where an attempt was made to develop one aircraft for the U.S. Air Force and Navy. This TFX program did result in the F-111 supersonic bomber used by the Air Force and Australia. The Navy rejected the aircraft and went on to purchase the F-14 Tomcat long range fighter. The F-111 had a drawn out development and the desire to have it due multiple missions for different services increased this and the cost increases reflected this. In the upcoming 2011 defense budget the F-35 program will be restructured again to delay production and extend development. Money will have to be reprogrammed from buying aircraft to paying for this development extension. Lockheed Martin (LMT) the lead contractor on the program has offered up taking some money out of its fee from the development phase but the extended production run will only add money to the back end. Lockheed will make up some of the money lost in 2011 – 2013 through these quantities. Of course the question to ask if Wilson’s suggestion was acted on would be what to do for a new fighter? The F-35 is it. It will replace F-16, A-10, F-18 and AV-8 aircraft in service with the U.S. Air Force, Marines, Navy and allied inventories. The F-22 is a purer, long range fighter that was supposed to replace the F-15. Now less then 200 will be built and they cannot supplant the large numbers of other aircraft. It also doesn’t exist in a carrier based version so it cannot do the F-18 or AV-8 mission. There had been attempts to restart the F-15 production line in the early part of this decade but nothing came of that. Perhaps the F-18E/F/G could be built for the Air Force as well as the Navy and Marines? So if an existing aircraft cannot be produced to replace the aging F-16, F-18 and AV-8 force then a new replacement program will have to be started. Even if there are no advanced requirements but a straight replacement there will be the great cost of beginning again a development program and ramping up a production capability. It would also make little sense in building a new aircraft without adding advances in sensors, weapons, survivability and electronics. This will increase the cost to both produce and operate the aircraft. I know one officer whose way was paid through the Air Force Academy, who trained other fighter pilots for several years, and who now wears shorts and a polo shirt and works on finish carpentry every day for his base because the Air Force has no fighter for him to fly and nothing else for him to do. The existing fleet of aircraft is aging. This means that stress corrosion cracking and fatigue on structural members and rotating parts has begun to take its toll. Aircraft cannot fly forever, and while it was in vogue to bash the F-22 several months ago, remember what The Captain’s Journal said. The Captain’s Journal would feel better about the F-35 as the next generation all purpose fighter aircraft if it had seen production and flying hours. But it is inferior in air-to-air combat and yet to be flown by U.S. AF pilots. Also note that in spite of what the QDR might conclude, we have recommended replacement of the sea-based expeditionary model for forcible entry with a combined sea-based and air-based approach that doesn’t rely on the Expeditionary Fighting Vehicle. We have recommended heavier reliance, not less reliance, on manned air power both from land bases and sea-based craft as an important leg of conventional, expeditionary, counterinsurgency and hybrid warfare. We will grant the point that the VTOL F-35 will be a mainstay in the Marines’ model rather than the F-22, but if the skies are controlled by rockets and enemy aircraft, the sinking of an Amphibious Assault Dock with an entire Battalion of Marine infantry on board would end whatever expeditionary entry that was planned. Air power is critical to the success of every form of warfare mentioned above. It may be that the F-35 will come along in time to contribute to interim needs, and that its inferiority to the F-22 won’t do harm to the conduct of its mission. But this hasn’t been proven to our standards. I sounded the alarm, but Mr. Potter is placing meat on the skeleton. Listen carefully to what he is saying. This will become an urgent situation without action. The F-35 is behind schedule, so the DoD is rearranging the deck chairs. The U.S. Defense Department is slowing Lockheed Martin Corp’s $300 billion F-35 fighter jet program, a multinational effort, to stabilize its schedule and costs, according to draft budget documents obtained by Reuters. The department’s fiscal 2011 budget will request $10.7 billion to continue the F-35’s development and to procure 42 aircraft, a budget overview shows. Overall, the plan is to cut planned purchases by 10 aircraft in fiscal 2011 and a total of 122 through 2015. The Pentagon “has adjusted F-35 procurement quantities based on new data on costs and on likely orders from our foreign nations partners and realigned development and test schedules,” the document said without giving details. “Stabilize its schedule and costs …” This is a euphemism to indicates that the DoD won’t outspend the development capabilities of the program, and since the program is behind schedule, the development dollars will decrease. All the while, aircraft are being retired, trained pilots are busy doing carpentry work on board their base, and as The Captain’s Journal pointed out, the F-35 has yet to log a single flying hour – even though it is supposed to be the cornerstone of the U.S. air fleet. There is trouble in the air, and it isn’t of the sort that can be solved by wishful thinking about future weapons systems or flying gadgets that have yet to be designed or tested. We told you so. I also can foresee the Troops being told to remove the offending ‘codes’ and several filing through the outer casing of their sights causing a subsequent blanket order to cease filing and directing Cdrs to turn all the sights in to DS Maintenance for removal of the offending characters IAW MWO 9-236-10 followed by a GAO audit to determine how much the whole drill cost. 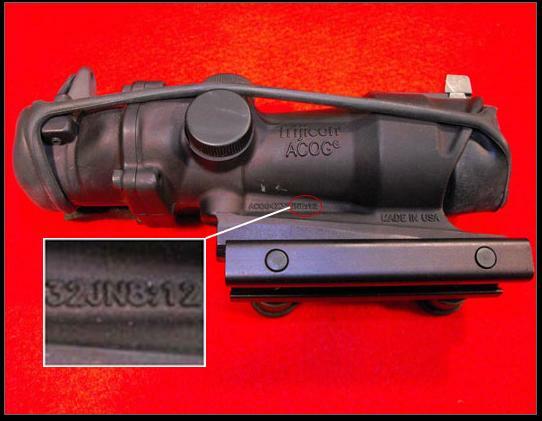 So by now you are all aware of the Biblical inscriptions on ACOGs sights sold by Trijicon to the U.S. Marines and Army. Without rehearing the details, the owner of the company who makes the ACOGs sights for the U.S. Marines is a Christian, and he has found a unique way to take pride in his work. He has tooled his factories to inscribe certain Biblical passages on the ACOGs sights. General Petraeus is disturbed over the inscriptions. The U.S. Marine Corps is concerned, and Trijicon has agreed to remove them. Even the washed up, burned out, pacifist hippies at Creative Loafing have weighed in with indignation over the inscriptions (and Muslims with faux outrage after this was hyped in the American media). The Huffington Post has their usual knee jerk reaction. Kits have been distributed to remove the inscriptions from those sights which are currently in service (even though, rather surprisingly, the British Ministry of Defence has refused this remedy because it will remove weapons from the field where they are needed). They’ve taken a pass. Now, I would never have included the inscriptions on the sights, but not because I disagree with the inscriptions. In general, I’m a boring kind of guy and just not creative enough to have come up with the idea. With General Petraeus, I am “disturbed” about a great many things: that we initiated Operation Iraqi Freedom with fewer troops than necessary to maintain the peace once the regime fell – that we have too few troops now in Afghanistan – that we may be losing our conventional capabilities as we necessarily focus on irregular warfare – that our warriors need an entirely new generation of weapons that won’t be funded – and so on the list could go. But “disturbed” over these inscriptions? Not even nearly. Generals should worry over things that warrant worry, such as micromanaging the campaign. As for Trijicon, they have behaved admirably throughout this silly ordeal. If it had been me, I would have let the Marine Corps explain to parents and spouses of Marines why they rejected the best optical sights on the planet because someone who wasn’t involved in this objected to my world view. I would have responded, ‘Oh, go blow it out your …..,” well, never mind, that wouldn’t be very Christian. One of the three main leaders of the Afghan insurgency, mercurial warlord Gulbuddin Hekmatyar, has a long history of switching sides, and once fought against his current Taliban allies. Now, he has held out the possibility of negotiating with Afghan President Hamid Karzai and outlined a roadmap for political reconciliation, opening what could be the most promising avenue for Mr. Karzai’s effort to peacefully resolve the conflict. It is far from certain that any talks with Mr. Hekmatyar will begin, let alone succeed. But in contrast to Taliban leader Mullah Omar and allied insurgent chief Sirajuddin Haqqani, who refuse any talks with Kabul as long as foreign troops remain in the country, Mr. Hekmatyar took a much more conciliatory line in a recent video. Unlike in previous videos, where Mr. Hekmatyar used a Kalashnikov rifle as a prop and expressed support for al Qaeda, in the latest tape, recorded in late December and provided to The Wall Street Journal by his aides in Pakistan, he assumed a professorial tone, wearing glasses and a black turban as he spoke in a quiet, soft voice. Mr. Hekmatyar, who is 59 years old and lived in exile in Iran when the Taliban ruled Afghanistan, built his movement over the last three years into a formidable force. 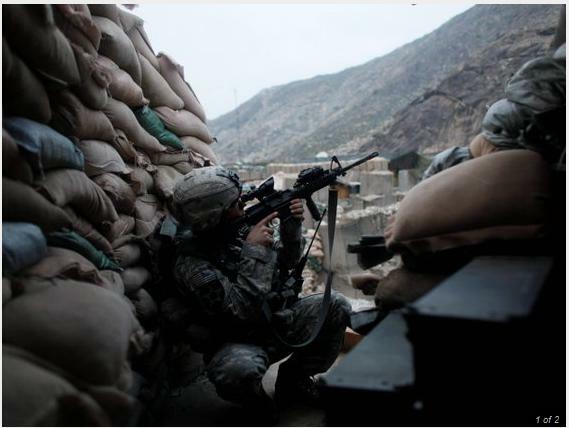 His men dominate the insurgency in several eastern and central Afghan provinces, such as Kunar, Laghman and Kapisa, according to American intelligence estimates. At the same time, a legal wing of Hizb-e-Islami, an Islamist party that Mr. Hekmatyar founded in the 1970s, participates in the Afghan parliament, with 19 of 246 seats. One of its leaders is minister of the economy in Mr. Karzai’s new cabinet. Though the legal Hizb-e-Islami denies formal links with Mr. Hekmatyar, many of its senior members are believed to maintain communications with the grizzled warlord, and openly support the idea of bringing him into the government. Mr. Hekmatyar’s “reported willingness to reconcile with the Afghan government” has already become a key factor working against the militancy because it “causes concern that others may follow,” the U.S.-led international forces’ intelligence chief, Maj. Gen. Michael Flynn, noted in a recent presentation. In addition to subtracting fighters from the battlefield, such a reconciliation would boost the legitimacy of the Kabul government. Currently, fighters of the three main groups—Mullah Omar’s Taliban in the south, where the bulk of combat takes place, the Haqqani network in the southeast, and Mr. Hekmatyar’s men in its strongholds—cooperate with each other, at least on the tactical level, American intelligence officials say. McChrystal says that there has been enough fighting. This so-called reconciliation is being pressed from the Afghan – ISAF – U.S. side. Hekmatyar appears to be seizing the opportunity being presented to him. But he has become a powerful warlord, and I predict that if the Taliban prevails in Afghanistan, Hekmatyar and they will come sweetly with each other. He will be nice with whomever he needs at the moment, and the Taliban won’t take up an unnecessary fight. My point is that the payoff of any alliance with Hekmatyar will ultimately depend on other things that we must do, such as militarily defeat the Taliban. Either way, this process is backwards from what it was in the Anbar Province of Iraq. The first alliance between the U.S. Marines and Iraqis occurred after they had already started opposing AQI. Concerning Abdul Sattar Abu Risha, he was negotiating with U.S. forces while we were killing his tribal members who were part of his smuggling ring. In Operation Alljah, invitations were opened for indigenous Fallujans to join the IPs only after an utterly massive application of military force within the city and surrounding locations. No one wants to see more death and bloodshed of U.S. or ISAF forces, or of Afghan noncombatants. The best way to ensure that this is minimized may be to kill more insurgents. If they come to the table, it should be they who request it – while we sit in a position of strength. I don’t think your comparisons to Anbar and Helmand Provinces really bear out. I’ve been to Kunar Province, and in the vicinity of Wanat. The terrain is vastly different. The terrain in Helmand allowed the MEU to employ a completely different approach. Also, I don’t really think your points on ROE are particularly germane to the discussion of Wanat. If the platoon had engaged those personnel, I don’t believe it would have changed the outcome of the battle one bit. Positive identification is as difficult as it is critical in a counterinsurgency environment. I can think of numerous instances where I thought someone was an enemy combatant, when in fact they were not. Where I think you hit the nail on the head is when you mention the terrain. The platoon in Wanat sacrificed control of the key terrain in the area in order to locate closer to the population. This was a significant risk, and I don’t see any indication that they attempted to sufficiently mitigate that risk. I can empathize a little bit – I was the first Marine on deck at Camp Blessing back when it was still Firebase Catamount, in late 2003. I took responsibility for the camp’s security from a platoon from the 10th Mountain Div, and established a perimeter defense around it. Looking back, I don’t think I adequately controlled the key terrain around the camp. The platoon that replaced me took some steps to correct that, and I think it played a significant role when they were attacked on March 22nd of 2004. COIN theorists love to say that the population is the key terrain, but I think Wanat shows that ignoring the existing natural terrain in favor of the population is a risky proposition, especially in Afghanistan. The application of the ROE discussion has taken a different turn, and my point may be correct. But Slab’s point is still valid, and our discussion of the Battle of Kamdesh bears out the point about terrain (see also Video of COP Keating). Now comes a picture via The Washington Times. Two questions. Can someone tell me when Combat Outposts became “Command Outposts?” Why the name change and what does it mean? Second, exactly why is this COP located on low terrain? Given the lessons we have learned from Wanat and Keating, why is COP Michigan located on low terrain? While we should be thankful that various individuals at Fort Hood acted in a “prompt and courageous” manner thereby preventing “greater losses,” it should never have gotten to that point. The Defense Department’s system is not working if it is left to first responders to stop a terrorist. A traitor within the military’s ranks, with compromised loyalties that had been known about for years—as was the case with Hasan—should be stopped before his finger is on the trigger. Therein lies the central problem with the Pentagon’s report. It says nothing of consequence about Hasan or how to stop individuals like him in the future. Hasan is not even named in the report, but instead referred to as the “alleged perpetrator.” The report’s authors contend that the sanctity of the criminal investigation into the shooting needs to be upheld. But this is not an excuse for failing to name the attacker. The whole world knows that Major Nidal Malik Hasan did it. Nor is the ongoing criminal investigation a valid reason for avoiding a serious discussion of Hasan’s ideological disposition. The report’s authors instead go to lengths to whitewash Hasan’s beliefs. Was Major Nidal Malik Hasan a child molester, a drug addict, or suicidal because of a recent divorce? No. So what does any of this have to do with the attack at Fort Hood? Absolutely nothing. Religious fundamentalism alone is not a risk factor; most fundamentalist groups are not violent, and religious-based violence is not confined to members of fundamentalist groups. This is a true statement; it is also completely meaningless in respect to the Fort Hood massacre. The brand of religious fundamentalism practiced by Hasan is specifically devoted to violence. This article by Thomas Joscelyn rehearses some of the things we discussed in Radicalized Christian Terrorism. On a complex topic it’s easy to misunderstand truncated prose. This is the kind of topic that is better carried out as a series of conversations. I think it would certainly be fair to name any abortion bombing or killing as Christian terrorism. Admittedly, that is not near the problem that exists in Islam, but I disagree that is because Christianity is inherently peaceful and Islam is violent. At one time Christianity was not at all peaceful; surprisingly no one has mentioned the reformation and the wars of religion that lasted an extraordinarily long time, tore Europe apart, and were monstrously violent. That violence ultimately exhausted Europe and led to the Peace of Westphalia, the first harbinger of secularism. As secularism (and nationalism) ascended so religious violence in Europe dropped. Are you comfortable with the idea that the greater prevalence of religious violence in Islam might not be due to Islam being a more violent religion but because western civilization has embraced the (now) leftist doctrine of secularism and Islamic countries have not? Any conversation on this that begins without these two texts as a backdrop is a waste of time. So moving back to the issue of “any abortion bombing or killing as Christian terrorism,” this is once again a conflation of issues, a confusion of boundary conditions for my thought experiment. We absolutely must get definitions and boundaries right for the conversation to have a common language. Without rehearsing the boundaries I laid down in the original article, let’s approach this from a different perspective, i.e., the perspective of Islamic terrorism. A quick survey of my articles on Iraq and counterinsurgency shows without equivocation that I did not believe during the height of the insurgency, and do not believe now, that all insurgents in Iraq fought for religious motivation. In fact, most of them didn’t. To be sure, the several hundred per month who crossed the Syrian border coming from Somalia, Chechnya, Saudi Arabia, Jordan and other locales, included many who did fight predominately for religious motivation. But the indigenous insurgency primarily did not. During Operation Alljah loud speakers were used by U.S. forces to address the public at Mosques, and even though this is a religious gathering, per se, I do not include this as religious-based insurgency or counterinsurgency. The Mosques were targeted as being the center of public activity and philosophy. Again, a survey of my posts reminds the reader of just how involved we have been in attempting to understand how to separate an indigenous insurgency – who fights for many reasons, including money, youthful exuberance, boredom, etc. – from the religiously- based leadership. Not all shootings in Iraq were a result of jihad. Nor have I categorized religious-on-religious violence (e.g., Shi’a on Sunni and vice versa) within the rubric of jihad or religiously-based violence. My definitions were very specific, and included the notion that one believes that his specific religious views warranted propagation via violence or subjugation of unbelievers. Wars of power, convenience, tribe, family, wealth-seeking, and so on, do not qualify under this rubric. As for Islam, I have dealt with the competing hermeneutics within the Muslim world before by addressing stolid comments by Professor Steve Metz of the U.S. Army War College. Feel free to go study them in some detail. I am left in this thought experiment without any compelling evidence whatsoever that anyone can come up with a single example of Christian terrorism that meets my definition – a definition, by the way, that I have consistently applied to Islamic terrorism as well. You may disagree, you may respond with fury and fist. But what you cannot do is charge me with inconsistency. I have treated both Islam and Christianity with the same standards. In the mean time, I continue to be amused at the felt-need to legitimize moral-equivalency arguments, and even if you can find an example of Christian inspired terrorism, I have made you search hard. The search is hard because Christian Biblical hermeneutics doesn’t support terrorism. Taking a quick detour, I have always been a fan of John and Abigail Adams. John is in my opinion in many ways the singular father of our republic. The strength of Abigail Adams is a story with its own merit, and worthy of study by any woman who aspires to greatness. Without her, John wouldn’t have been the man he was. Watching the HBO series John Adams made me even more a fan of John and Abigail. Quite simply, it is stunning, and if you’re like me, you intended to watch a DVD, put it aside, watch another next week, and so on. I ended up watching all of them in a single day. I couldn’t help myself. That’s it. I find a whole host of reasons to dislike Mr. Obama, but this sums the issue up as nicely and succinctly as I can imagine. If you haven’t watched the HBO series on Adams, you must do so as soon as possible. After completing it, sit back and ponder the proposition that Obama is, at his core, the anti-John Adams. Secretary Gates is again pressing Pakistan to see the Taliban and al Qaeda (one presumes he means here both the Pak-Taliban and Afghan-Taliban) as our common enemy. RAWALPINDI, PAKISTAN — Defense Secretary Robert M. Gates made an unannounced trip here Thursday to urge Pakistan to expand its crackdown against the Taliban as well as to counter skepticism about the Obama administration’s new war strategy for Afghanistan. But there is an increasing symbiosis between the Pak-Taliban, the Afghan-Taliban and al Qaeda, and launching strikes against one is like strikes against them all. While Pakistan may see the Tehrik-i-Taliban as a potential enemy of the state, it still sees the Afghan-Taliban (the Quetta Shura) as its balance against India. Myra MacDonald has an interesting article on “strategic depth” that warrants attention. She begins by citing a Pakistani commentator, and then discusses her own personal perspective given her history in the region. This is an extended read, but well worth the time. “Let us presume that the Indians are foolish enough to get distracted from educating their people, some of whom go to some of the best centres of learning in the world. Let us assume that they are idiotic enough to opt for war instead of industrialising themselves and meeting their economic growth targets which are among the highest in the world. Let us imagine that they are cretinous enough to go to war with a nuclear-armed Pakistan and effectively put an immediate and complete end to their multi-million dollar tourism industry. Let us suppose that they lose all sense, all reason, and actually attack Pakistan and cut our country into half. “Will our army pack its bags and escape into Afghanistan? How will it disengage itself from the fighting? What route will it use, through which mountain passes? Will the Peshawar Corps gun its tanks and troop carriers and trucks and towed artillery and head into the Khyber Pass, and on to Jalalabad? Will the Karachi and Quetta Corps do likewise through the Bolan and Khojak passes? And what happens to the Lahore and Sialkot and Multan and Gujranwala and Bahawalpur and other garrisons? What about the air force? Far more than anything else, what about the by now 180 million people of the country? What ‘strategic depth’ do our Rommels and Guderians talk about, please? What poppycock is this? Pakistan’s policy of seeking strategic depth in Afghanistan has been up for discussion since 9/11, when it was forced to abandon the Taliban regime it had backed to try to contain Indian influence there and give itself the space that it felt was so lacking on its eastern border. I have heard Pakistanis saying it was a stupid idea; others saying that even within the Pakistan Army there was a recognition that strategic depth nowadays was best achieved through building a strong domestic economy. Unlike 1971, when Pakistan was cut in two after Bangladesh, then East Pakistan, won independence with Indian military support, the notion that it might be split in half by an Indian offensive pretty much became outdated when both countries announced they had tested nuclear weapons in 1998. So is Shafi tilting at windmills? Attacking an idea that belonged to the last century? Not entirely. Strategic depth has become ingrained in the narrative of relations between India, Pakistan and Afghanistan — so taken for granted that I remember being rather surprised myself when a subeditor, quite rightly, asked me to explain what it meant. It may no longer apply in the pure military sense of providing a space to which the army can fall back and where reserves and supplies can be stored, but as a theoretical and emotional concept it lingers. Notice the idea of Pakistan being forced to abandon their support for the Afghan-Taliban after 9/11. If we wish once again to force Pakistan to abandon their investment in the Taliban, half-way measures won’t do. The AfPak theater of operations must be seen as the focal point of the battle against the transnational Islamic insurgency, and we must resource the campaign with this in mind. Did Secretary Gates’ admonition accomplish its mission? Not even nearly. Pakistan’s army has said it will launch no new offensives on militants in 2010, as the US defence secretary arrived for talks on combating Taliban fighters. Army spokesman Athar Abbas told the BBC the “overstretched” military had no plans for any fresh anti-militant operations over the next 12 months. Our correspondent says the comments are a clear snub to Washington. But it gets worse. Pakistan is even worried that the buildup of U.S. troops in Afghanistan will send fleeing Taliban across the so-called border into their territory. This is a fairly rudimentary issue to be so far and so many years into the campaign – this notion that the intent is for the Pakistanis to press the Taliban from their side while we press them from the Afghan side. This all points to a Pakistan that still doesn’t see the Taliban as an existential threat, a Pakistan that can still use the Taliban as a balance to Indian power (however quaint the notion), and a Pakistan that simply wants to see it all go away – and believes that a cessation in military operations will accomplish this. Asking the question whether al Qaeda and the Taliban are in Pakistan or Afghanistan is like asking whether the water is on the right or the left side of a swimming pool. The conversation on Pakistan versus Afghanistan presupposes that the Durand Line means anything, and that the Taliban and al Qaeda respect an imaginary boundary cut through the middle of the Hindu Kush. It doesn’t and they don’t. If our engagement of Pakistan is to mean anything, we must understand that they are taking their cue from us, and that our campaign is pressing the radicals from the Afghanistan side while their campaign is pressing them from the Pakistani side.